Keynote speaker General Tommy Franks (Ret.) 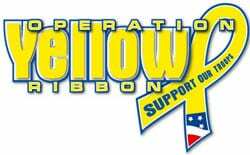 will join artists Charlie Daniels and Amy Grant on Tuesday, March 23 for Operation Yellow Ribbon, presented by Challenge America and David Lipscomb University. Special acoustic performances by Daniels, Grant and a host of other musicians will also be a part of the evening activities. Operation Yellow Ribbon features a daylong symposium with the theme of “solutions for transition from battlefield to home front for returning military and their families.” Breakout sessions will address a variety of topics, including ones related to returning injured military and adapting to life after those injuries. Special musical appearances by Daniels and Grant are scheduled for the 7 PM event. A limited number of tickets for the evening event with Franks, Daniels and Grant will go on sale for $10 on February 15 at the Lipscomb University box office and through Ticketmaster. Members of the military and their families will be invited as guests of the event’s corporate sponsors. Proceeds from the evening event benefit Lipscomb University’s Yellow Ribbon Program, which offers eligible military veterans and their family members an undergraduate degree tuition-free or a graduate degree at a greatly reduced tuition rate.